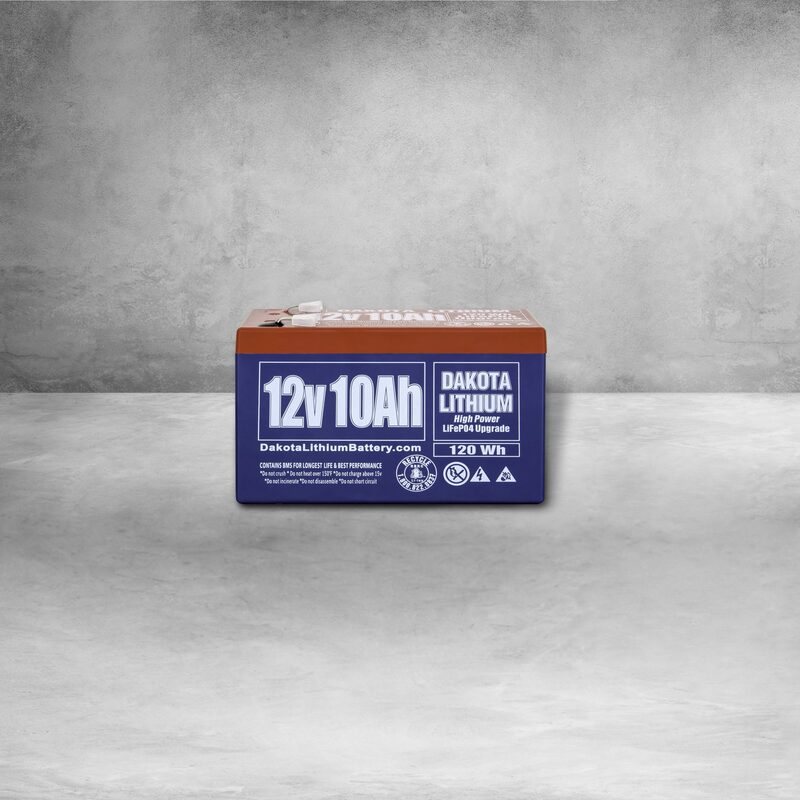 Built Dakota tough, this 12 volt lithium battery packs a big punch. 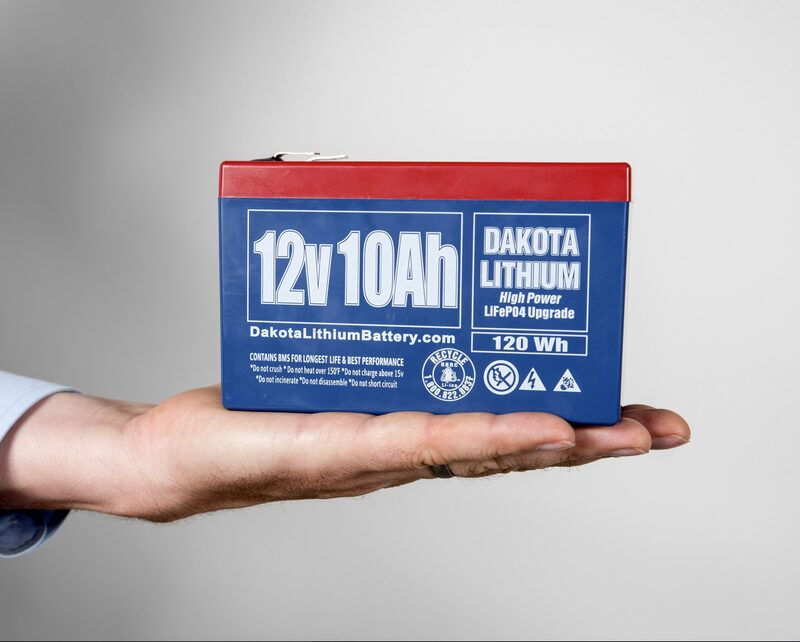 Engineered with Lithium Iron Phosphate (LiFePo4) technology this battery has twice the power, half the weight, and lasts 4 times longer than a sealed lead acid battery – providing exceptional lifetime value. The #1 battery for fishing electronics, outdoor use, and SLA replacement. Replaces UB1280 battery and many more. LiFePO4 charger recommended. 2lbs 14oz (1.30Kg). That's 60% lighter then a SLA battery. 10 ampere hours. 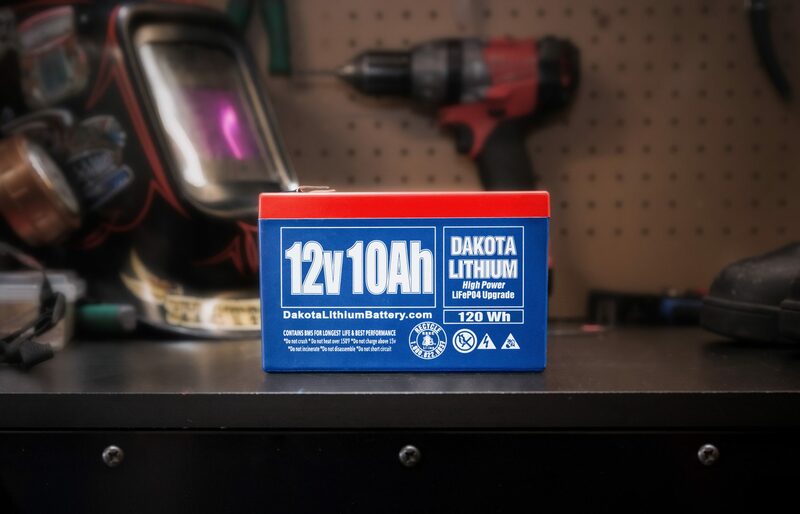 Dakota Lithium batteries provide consistent power for all 10 amp hours. 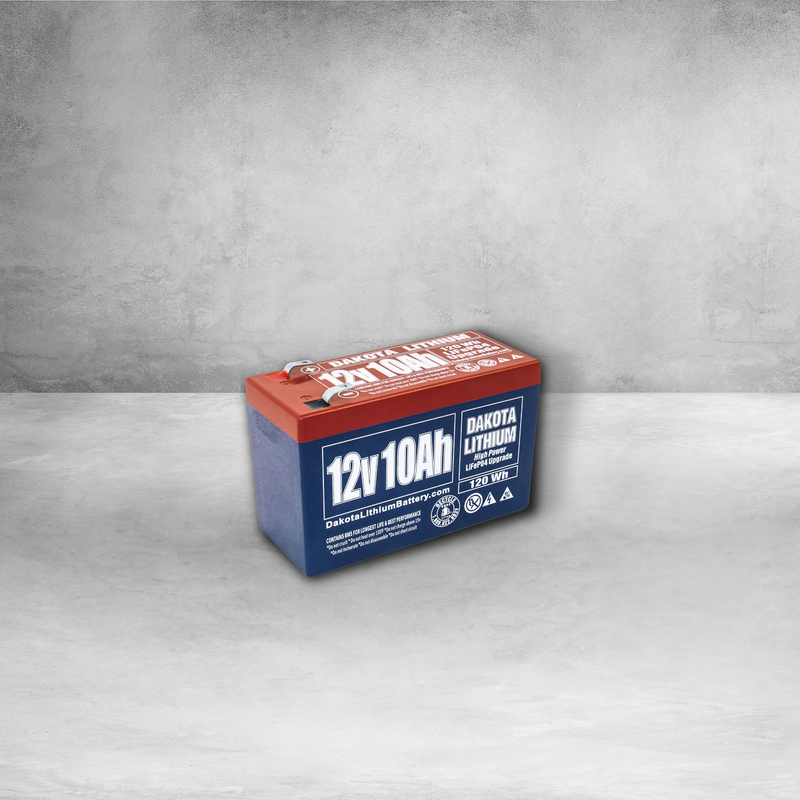 DL LiFePO4 batteries have a flat voltage curve, which means they have a steady power output as the battery discharges. The power output will not dramatically drop like similar sized SLA batteries. You get all the juice down to the last drop. Very Good Battery. Well worth the cost. Now that I have a couple of months of use, I can honestly say: You will find this is an impressive battery if your experience has been only with Lead-Acid batteries as mine has been. This battery seems to retain its charge well when left “on shelf”. It has amazing high current output over lead acids, specifically 10 amp drain for 30 minutes w/o significant voltage drop (considering it’s size I’m impressed). No more lead acid batteries for me. Works great in my Marcum LX6! Long life over the lead battery. Brought life back to my UPS battery backup for my computer. The max 20A draw reduces my UPS max load from 600W to ~450 w, but that’s fine for my use. Returned my runtime to about an hour from the 5 minutes my old batteries were down to. The UPS is still bad at estimating time left because the voltage curve isn’t what it expects. So after 20 minutes of predicted runtime, I get another 40 minutes+ while the UPS says 0 minutes remaining. If it all lasts 10 years, it’ll be money well spent. Excellent battery.. Very light..well worth the money..great power. I expect to give this 5 stars after I use this battery in my intended application for an emergency ham radio station. I chose a LiFeO4 battery design since this is the safest chemistry of the lithium battery types. This is a powerful battery and I wouldn’t want self induced battery issues with this much potential energy available. The LiFeO4 chemistry battery is much more tolerant of misuse or the potential for self induced fires and is much safer than LiPo chemistry. The LiFeO4 chemistry is much more expensive but worth it to me. Also this chemistry can generally be safely charged with a charger designed for gelled lead acid battery types and the cell matching and equalization is much better than other types. Sealed into a tough case this battery is not subject to handling damage like many of the LiPo batteries that simply put a thin sleeve or shrink wrap over the cells. Such batteries must be handled carefully otherwise any incidental damage can invite risk of fire. This battery has a very substantial casing that will withstand rough handling very well. Expensive But Powerful and Lightweight. So far, so good. Most expensive battery I ever bought, but is light weight and seems to offer a lot of reserve power. I use this in a ice fishing locator, took 5.25 lbs off of the locator compared with 12 Ah lead acid battery that came with the locator. The lithium battery last as long as I would expect and charges fast. Exceeds expectations! My 24 vdc mobility scooter motor is 7 years old, with probably a worn commutator. Despite cleaning the motor’s carbon dust out and replacing brushes – the machine wears out new deep cycle gel cells twice as quickly as when it was new. This off-road capable scooter is used to run my 5- off leash, large breed working dogs daily. We chase coyotes at night, the dogs kill possums, and dig up gophers in the vast orchards here in the Central Valley. Big fun. But running out of power ruined my fun. When newer the scooter could go many miles – but with age has run down to half that even with new batteries. The Gel Cells are 50 amp hours – so I thought a pair of these 10 amp hour lithiums would only help get me home in an emergency. SURPRISE! With 2- of these in parallel with the 2- gel cells there has been an amazing transformation. As if by magic the machine now has twice the range it had without these lithium cells. What? 2- little 10- Ah batteries act as if there were new 50 Ah gel cells? I’m very happy! The dogs can have twice as much fun chasing critters at midnight without my fear of being stranded. My knees are worn out to bone on bone so I cannot walk miles home. Cell phone would do no good because there is no one to call who could find us. AMAZING BATTERIES! As funds allow I’ll add more and more of these and ditch the crappy, expensive Gel cells. THANK YOU! A really great battery for the price. Very happy with accessories, quality and performance. surprise…actually delivers as advertised. I concur with the tester that did a drain down test to this battery. I was very surprised to find a capacity of over 10AH on two tests with a remarkably high efficiency of recharge as previously reported. I stopped at 10.1AH since the voltage dropped to 10.2 volts under load at 4.6A drain and I did not want to excessively drain the battery. I bought the battery as a standby electric outboard battery in a sailboat. The LIPO4 has a great storage life as compared to lead acid as long as it is stored without a full charge. I will report back later on how it works out. So far I am impressed. Vastly exceeded my expectations. I used a rather sophisticated test setup that is capable of measuring amp-hours.